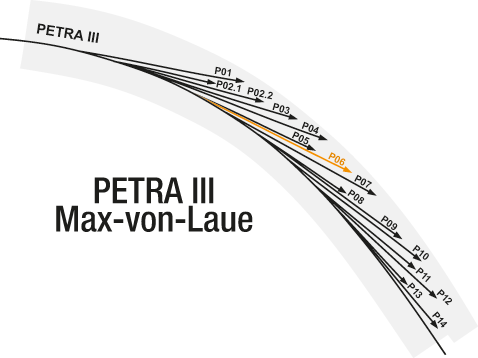 The location of P06 in the Max-von-Laue Experimental Hall is marked in orange. The Hard X-ray Micro/Nano-Probe beamline P06 at PETRA III provides advanced visualisation with micro/nanoscopic spatial resolution using different X-ray techniques such as X-ray fluorescence (XRF), X-ray absorption spectroscopy (XAS) and X-ray diffraction (XRD). Coherent diffraction imaging applying ptychographic scanning schemes enables X-ray microscopy with increased spatial resolution down to the low nanometer range. The beamline houses two different experiments in separate hutches: the Microprobe (EH1) and the Nanoprobe (EH2). The Nanoprobe is mainly based on nanofocusing refractive x-ray lenses. Using refractive optics, nearly gaussian-limited nanobeams in the range from 50 to 100 nm can be generated in the hard x-ray energy range from 8 to 30 keV. In a high-coherence mode, the instrument is well suited for coherent diffraction imaging schemes, such as ptychography, reaching highest spatial resolution (below 10 nm) and sensitivity in the hard x-ray range.Tomographic scanning modes are routinely possible. The Microprobe is a versatile experiment for scanning x-ray microscopy with x-ray fluorescence, x-ray absorption spectroscopy and x-ray diffraction contrast. A KB system focusses a beam of some 1010 photon/s down to 350 nm focus size in the energy range 5-21 keV. Compound refractive lenses (CRL's) are used at higher energies up to 50 keV. 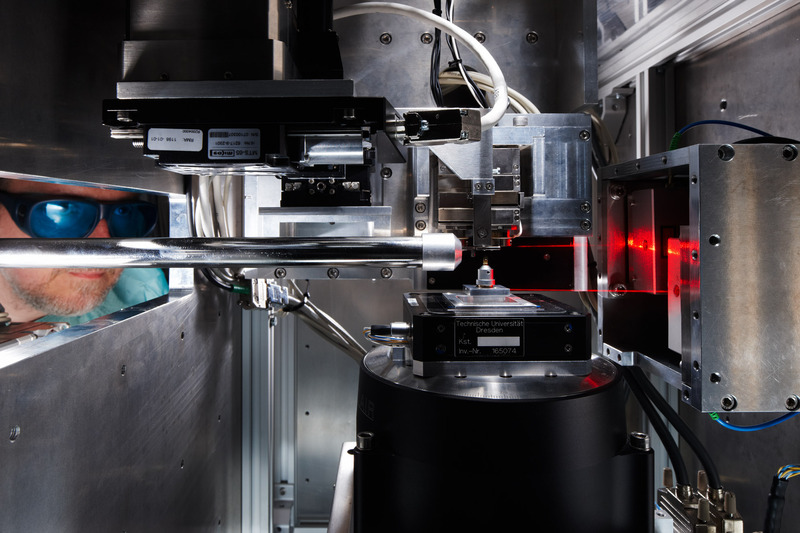 Advanced detector technology, namely the Maia x-ray fluorescence detector and the EIGER X 4M hybrid photon counting detector, enable on-the-fly scanning schemes with millisecond dwell times per scan pixel. The ability to collect megapixel images in less than an hour facilitates series of 2D images for full 3D fluo-tomography, spectro-microscopy, time-resolved in-situ microscopy or other multi-dimensional microscopic experiments.